As a kid, the concept of Halloween was relatively mind-melting: You show up at a stranger's house, and they literally hand out free candy, just for asking and dressing up like your favorite Power Ranger or Colombian drug lord. Imagine if you could do the same at, say, your local Krispy Kreme? If the thought of adult trick-or-treating tickles your innards, I'm about to drop a nugget of knowledge that may or may not cause you to break into "Monster Mash"-esque convulsions. This Halloween, there are myriad ways to score free (or heavily discounted) food, without going door-to-door. In fact, many of your favorite food chains are offering cheap eats on and around the 31st -- and we're about to tell you how to snag 'em. 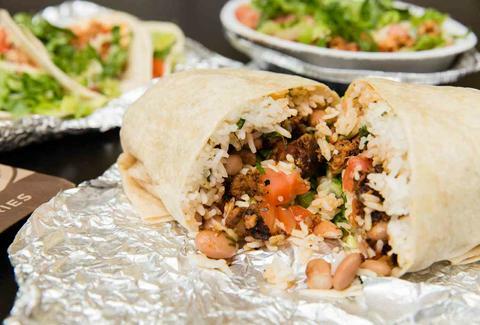 The deal: You can purchase a specially priced $3 burrito, expertly coined "Boo-rito." All you have to do is wear a costume with an unnecessary additive (like a vampire costume with a handlebar mustache, or a Donald Trump costume with an actual sense of self-awareness). It's all a statement about the surplus of unnecessary additives at dining establishments that aren't Chipotle (get it?). The deal: One free donut to anyone in costume -- and it has to be a real costume. You can't dress normally and claim to be an "off-duty fireman." The deal: One free "Scary Face" pancake. But there's a catch: It's only for kids under the age of 12. So, hopefully you know a kid you can borrow, or you just have boyish good looks as a result of vigorous daily moisturizing, like me. The deal: Nothing screams Halloween like half-priced corn dogs, obviously -- so Sonic made its trademark meat-on-a-stick 50 cents a pop in honor of Hallow's Eve. I mean... I'm not complaining. The deal: Snag a scoop of ice cream for a mere $1.31, and a chance to win free ice cream cakes for a year with its Piñata Pumpkin Patch Cake Promotion (yes, it's really called that). The deal: Buy a $1 coupon booklet from America's favorite redheaded burger-schlepper, receive five Junior Frostys, also support foster care services -- everyone wins. The deal: Everyone's favorite casual Australian-themed restaurant (or at least top five, right?) is jumping on the Halloween bandwagon by offering a pretty legit deal: 15% off an entire check (only for dine-in customers) from open till close. Don't forget to print out the coupon!